During this June weekend, my feed will be full of images of Jen Beeman leading a group of ten excited sewists in making an Archer button down shirt. I thought this would be a good moment to share with you a conversation I had recently with Cal Patch. If all the cool making you see on Instagram gets you thinking about joining in on the fun here at AGOS, we've got another garment sewing event coming up. 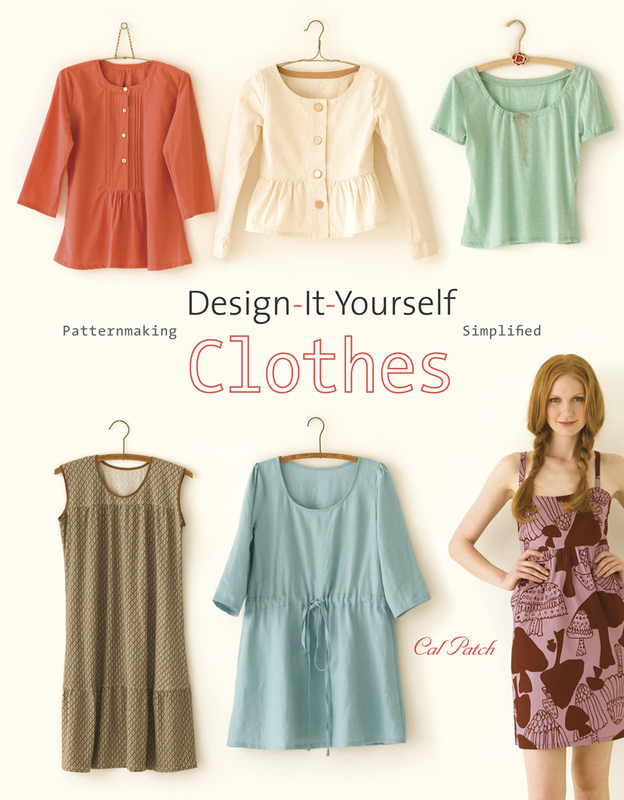 Cal will be here next month to teach a really cool workshop called Design (And MAKE) Your Own Patterns! I had the great pleasure to take a version of this workshop with Cal four years ago and it truly blew my mind wide open with the possibilities of fitting to my very own body. If you sew garments for yourself already, you know how liberating it is to be able to customize a garment to fit the particular slope of your shoulder, or the length of your torso. 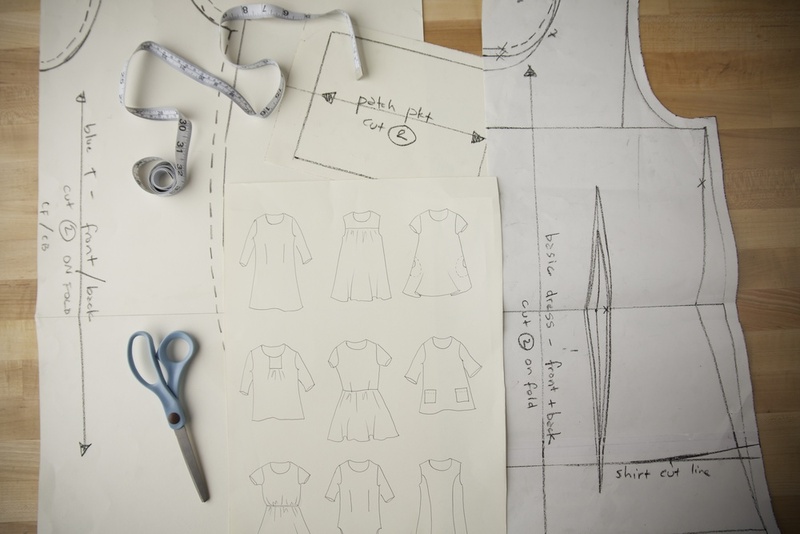 Take that a step further and imagine starting with your dimensions, and creating garments from scratch to fit you in all your individual loveliness! That's what Cal will be teaching here in our fully equipped studio next month. And there are still a couple spots left. Not a lot, but a couple. So if this idea rings your bell, go HERE and register.....soon! AGOS: How did you start sewing? Cal: I've always been into art and craft, and I did play around with sewing clothes in high school, but not with great success. It was in college (I majored in clothing -- aka fashion -- design) that I learned how to sew properly. AGOS: Can you tell me about an early make? AGOS: Do you have any favorite tools? Cal: I'm not too fussy about tools, and I try to keep them to a minimum. I'm not one to go out and buy every gadget on the market. I've had my same Gingher shears since college, which means I've had them for almost 30 years! (gulp.) One little tool that I'm so glad i finally bought, after years of resisting, are those little bias-tape folders. I have 3 sizes and they do make bias-tape making much quicker, and the tape looks much better! AGOS: Do you have a favorite time of day (or night) to make? Cal: I like to sew by day (afternoon is my prime time) and crochet by night, after dinner. AGOS: Where do you do your making? Can you describe what you like (or don’t) about your creative space? Cal: I have my own studio, which is the largest room in our house. It has one great feature, which is also its downfall: 3 sides of it are all windows and French doors out to a deck! So the light is amazing, and I can see nature all around me, and my garden and chickens! I love that. But, what I really need is 3 walls of floor-to-ceiling shelves, to house all of my fabric, yarn and other supplies. AGOS: Do you practice any other Crafts? What are they, and why are they different from sewing? Cal: Do I ever! Crochet is my other love, and for the most part they are perfectly complementary because I can crochet while traveling or in the evenings while watching a movie, so I do it at times when I couldn't sew. I love that crochet is very portable. Sewing tends to need a lot more space and supplies, so it only happens in my studio. I also spin, embroider, print, dye, and knit. AGOS: Why do you teach? Cal: I started teaching when I had my own shop, a dream that I learned was better (for me) as a dream than a reality. I'm not very good at selling, but teaching comes naturally, and I feel really good about empowering others to make. When I teach, I get inspired and excited by my students' enthusiasm, and it renews my love for craft. It also fascinates me how each student processes the skills they learn in their own way, and the end result reflects their own style. AGOS: Can you describe a typical day for you? Cal: I'm not a morning person. I get up around 8:30 and ease into the day with tea (teatime continues all day, actually! ), breakfast and emails, which always take much longer than I plan for. eventually I work my way into the studio where I work on orders from my Etsy shop, or design new patterns or samples for classes. Somewhere in there I have lunch; my boyfriend also works from home a lot, so we might have it out on the back deck or the front porch if it's warm out. Most days I get out for a walk with my dog Pippi; she likes to go down to the creek for a swim. After dinner I usually crochet on the couch while watching a movie or British detective series. AGOS: If you could sew with, or for, someone living or dead, who and what would it be…. Cal: Oh wow! I think it'd be fun to go back to the 70's and sew with Betsey Johnson. I've always loved her energy and playful designs. 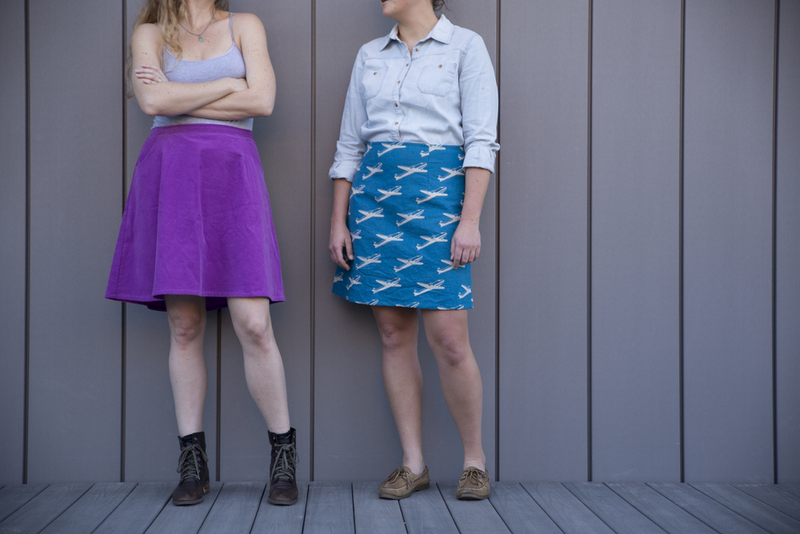 We'd probably make wildly printed knit dresses and matching leggings... not so far off from what I make now! You can read much more about Cal over at her blog Hodge Podge Farm. Check out her Etsy shop and see the beautiful garments that she has designed and offers for sale. She also has a numbers of classes available on CreativeBug which you can check out. We are really lucky to have her coming to teach here in Maine, and I am totally excited to host her! Will you join us?